Al Cervi left East High School in Buffalo after his junior year to start playing professional basketball. He played for teams in Buffalo and Rochester before World War II interrupted his career for four years. 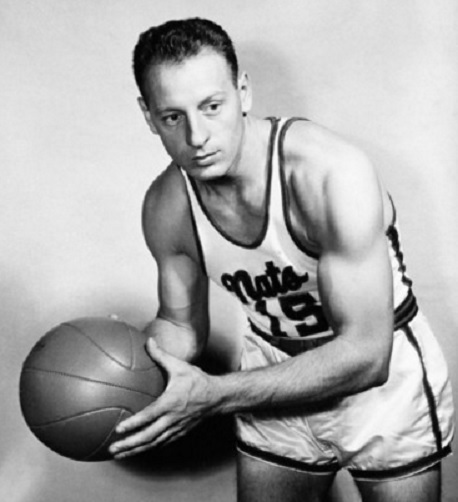 Upon his return from service, he spent three seasons with the Rochester Royals who won the 1945-46 National Basketball League championship. Throughout the late 1940s, Cervi reigned as one of the NBL’s premier guards. He was consistently among the league leaders in scoring and also was a tenacious defensive player. In 1948, Cervi moved to the rival Syracuse Nationals team where he successfully assumed the role as player-coach for the next five seasons. He finished his career in Syracuse with three more seasons as a bench coach and an outstanding overall record of 266-127. The highlights of his coaching career were the 1949-50 season when the Nats posted a league best 51-13 record and the 1954-55 season when his squad won the National Basketball Association title over Fort Wayne after a tough seven-game series. Cervi was elected to the Basketball Hall of Fame in 1985.